Spring is here, tentatively, minus a weekend of dreary weather and this morning’s freakish snow. For once, I actually didn’t mind seeing those snowflakes too much, probably because by the end of the week, it will be April, and I’ll be one step closer to sandals, sundresses, and the magic of springtime. My ritual for Ostara was simple, but I did bless these flowers (see photo below) in the name of the goddess, wanting their blooms to be a reminder of the healing power of nature and of the season of rebirth. I dedicated the then-closed blooms in honor of Persephone and Ostara (one, a woman who lives in both the Underworld and the world of the living, a vegetation goddess and reminder of the rebirth following darkness; the other,a fertility goddess whose name later became associated with the Christian holiday Easter). I thought of the sadness and hurting going on in the world, and I sent out energy of love and healing. Our lives, too, have seasons. In September of 2009, my grandfather died. It was less than two months after my wedding, a celebration of two lives entwining, the path my husband and I are walking together. My grandparents’ journey together had ended. I still grieve at this. The next spring, my sister announced her first pregnancy. My nephew was born in December; his birthday falls the day after mine. Separated by twenty-seven years, I am watching him grow, eyes opening to a world so new to him. In my own family, we are living the cycles of the seasons. This weekend, I returned from my aunt’s sixtieth birthday party. I am her namesake; we represent two generations of our family, and we’ve each walked our own path in life. 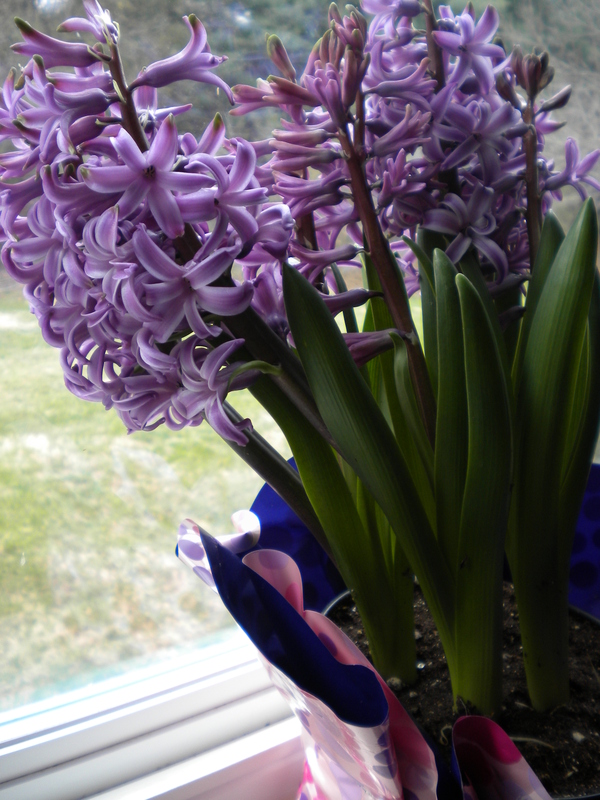 When I returned home from her party, I discovered the hyacinths I had blessed on Ostara had come to bloom. I’d brought them inside to protect them from the freezing temperatures that had plunged into the 20s and 30s. The lovely purple flowers were opening fully, pressed up against the window and straining toward the sun, soaking up the warmth of its rays. Their scent now permeates my office. This morning the purple flowers made a stark contrast to the snow coating the grass and trees outside. I’m looking forward to planting seeds in April—lettuce, basil, chives, maybe even chamomile. And in the midst of this morning’s snow, I tried to recall that each season has its place in the cycle of things. There is a time for spring, for newness, for the budding landscape. But winter’s frost, a time for rest, reflection, and sleeping earth, prepared the land for the excitement of spring’s thaw. How are you celebrating spring, the promise of rebirth and fertility, and the slow awakening of the earth around you? Wow. That’s too hot, even for me. Our winters here can be pretty fierce, though, so I’d like to one day live somewhere with a little more balance. Spring, summer, and fall are gorgeous, but I could go for winters that are a little more mild! Hyacinths are one of my favourite flowers – I just love the way they smell. Sort of like bluebells, although nothing tops bluebells for smell! I love hyacinths. They come in so many wonderful springtime hues. My office now is filled with the wonderful scent of flowers. Bluebells are lovely, too. And I love daffodils–they always seem so happy, like they are the true heralds of springtime.